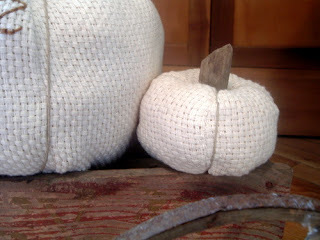 I am in LOVE my monk’s cloth pumpkins and I am going to share a tutorial with ya! 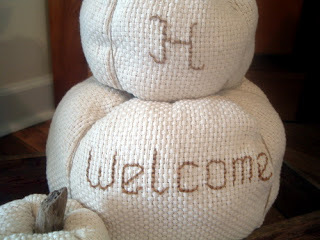 These great pumpkins will look fabulous in your fall home decor. Make them and re-use them year after year! Please note that some links may be affiliate links and a portion of your purchase will go to support this site. 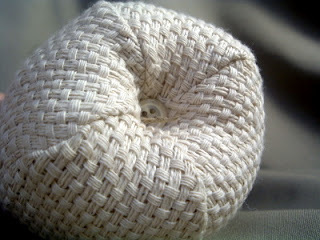 I decided to use something called monk’s cloth. I got it at Wal-mart so it should not be hard to find. Click here to search Amazon and have it delivered to your home. 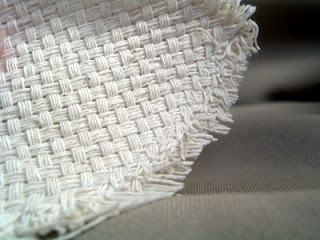 It is like soft white burlap but with a tighter weave. Gorgeousness! You will also need some sort of string. 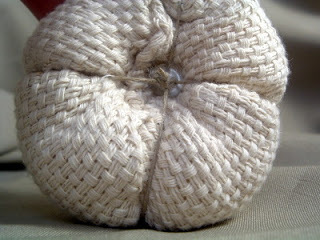 I used hemp cording. 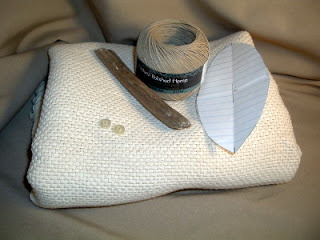 Find a couple of buttons, some embroidery floss if you choose, and some driftwood for the stems looks dreamy! Feel free to use my patterns to make any pumpkins. Link back to me pretty please if you blog about it! Cut your cloth from the pattern. You need four sides for each pumpkin. 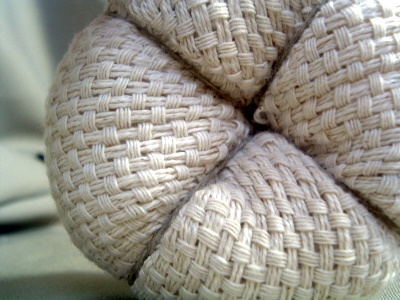 The large pattern is to be cut on the fold. Put two of your pieces together and sew around one side. I used a very fine stitch and sewed twice — right beside each other. The drawback to monk’s cloth? It can fall apart on you. Double stitching required. 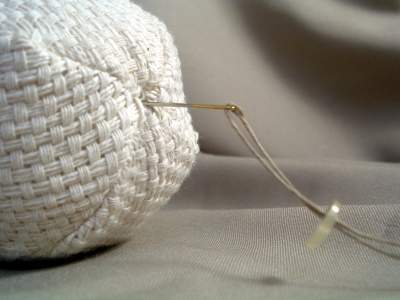 Keep putting on your pieces, sewing each one with a double stitch. When you get to the very last “side” and are sewing it “closed” leave a slit (about 2 inches is good). This is IMPORTANT!! Learn from my mistake! Sew around both sides of that slit BEFORE you try to turn and stuff your pumpkin. 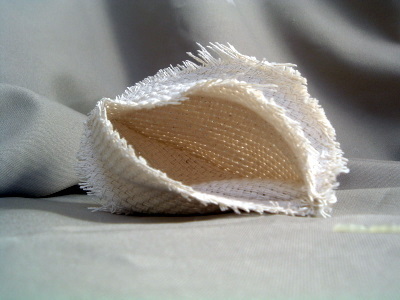 The turning process will make the monk’s cloth fall apart. 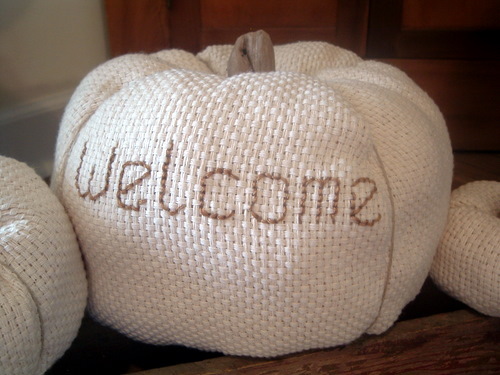 So after you sew down both sides of your slit, turn your pumpkin right side out and stuff it til you love it! If you want to embroider something on your pumpkin, do this after you turn right side out but before you stuff. So after you stuff, sew up your slit. 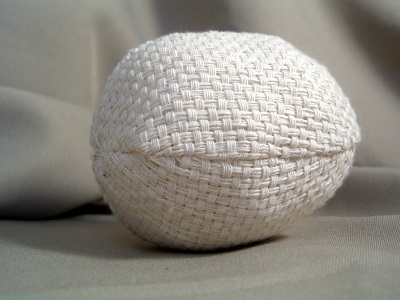 Now get ya a big needle and thread in your hemp cording. Tie a knot in the end and go through your button and then all the way through your pumpkin. And through a button on the other side. Run the cording up around one of the seams then back through the next button hole. Pull TIGHT!! All the way through the pumpkin again and to the button on the bottom. You repeat this down all 4 seams. See you pull TIGHT! That gives you that pumpkin look. 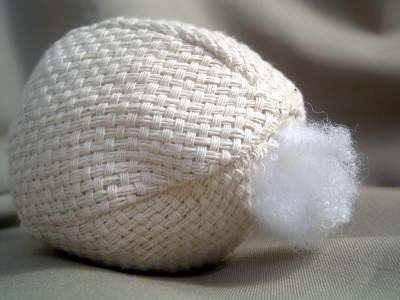 And the button keeps your thread from going all the way through the monk’s cloth. Tie off your hemp cording after you complete all 4 seams. Your buttons will almost disappear. Now all that is left is to cut off a piece of driftwood and glue it on the top. Make one or two or three! Creamy white gorgeousness!! Y’all be sure to let me know if you make any! 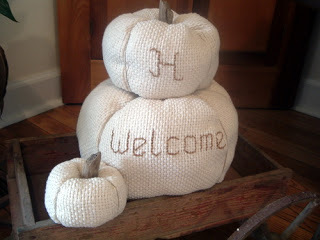 Love these pumpkins and want more? 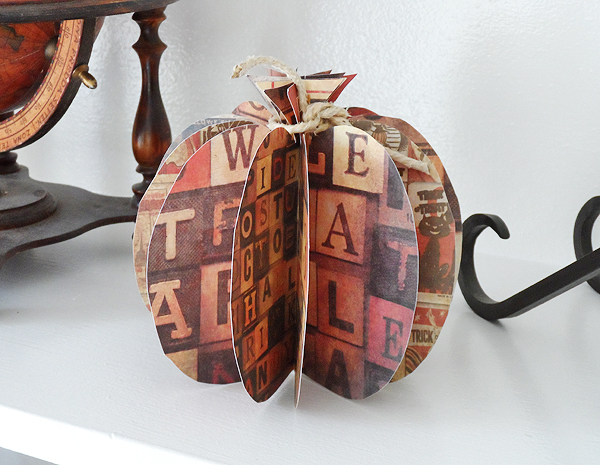 Try these 3D paper pumpkins from Crafts by Amanda. 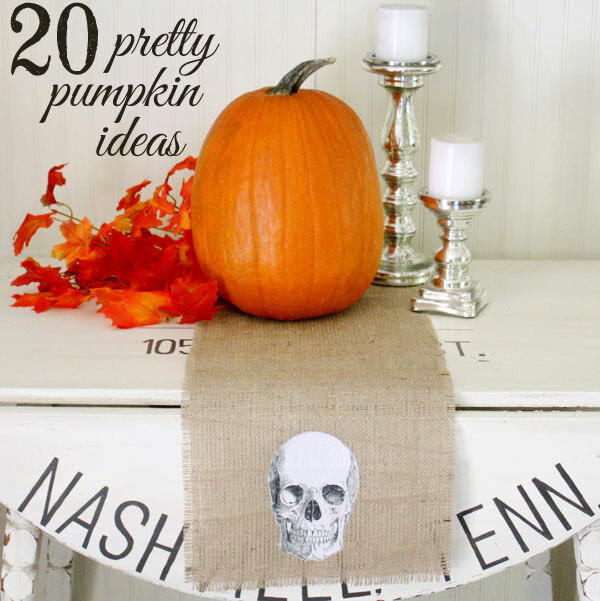 Or any of these 20 pretty pumpkin ideas. LOVE these ~ super cute! How yummy! I love them. So original! Can I just say I was totally surprised that your pumpkins got the lowest number of votes? I’m in shock because I love them. AND can I say that I am totally bummed that you got eliminated!!!! When I saw that you got cut, I had to read it a few times to make it real. You rock and I just don’t get it. These are beautiful. Keep up the great work! Love these pumpkins…simple white and lovely. Such a cute & original idea! Such cute pumpkins! You fabric choice is fabulous — love the natural look of it! I love that you did these in the creamy white monk’s cloth! They turned out so simple and classy! 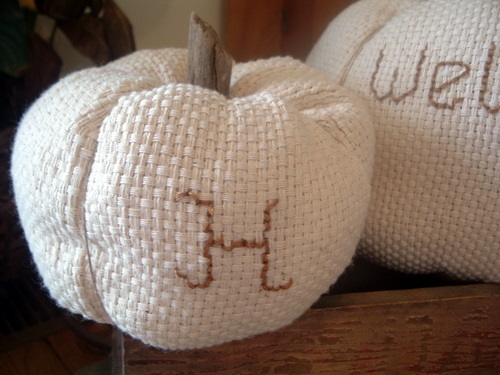 These are so cute and I love the fact that they’re monogrammed….such a good idea! !